Just like a gate or a door, an arch can rouse a joyous sense of anticipation. 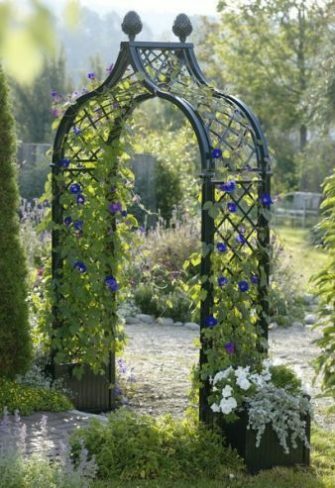 Attractively planted archways make a beautiful entrance. They add height to a garden, creating romantic vistas and spoiling us with an abundance of blossoms. Garden Arches can adorn pathways, lead from one section of the garden to another, marking the point at which the new section begins. Rose or clematis-covered arches also serve as a picturesque frame for garden benches – an attractive alternative to a rose arbour. For the queen of flowers, a fine archway is the perfect companion and will help to create a rich display of foliage and blooms with a truly seductive fragrance. 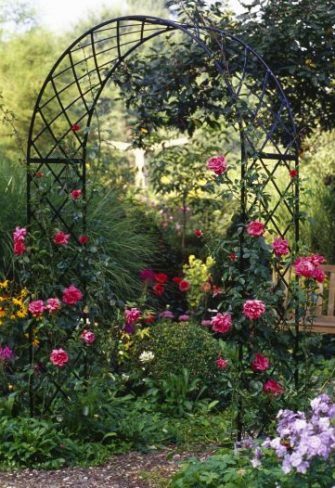 During the rose season, a planted rose arch with its profusion of colour will prove an irresistible eye catcher. What better way to add a touch of old-world romance to your garden! 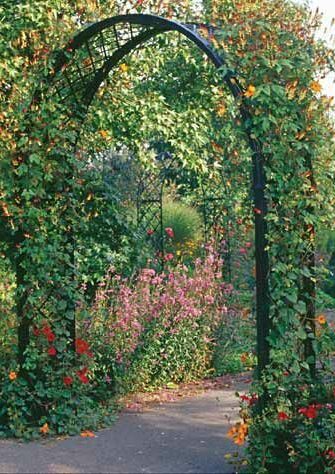 The classic use for a rose arch is as the entrance to a green refuge, either spanning a garden gate or marking the start of a main pathway. 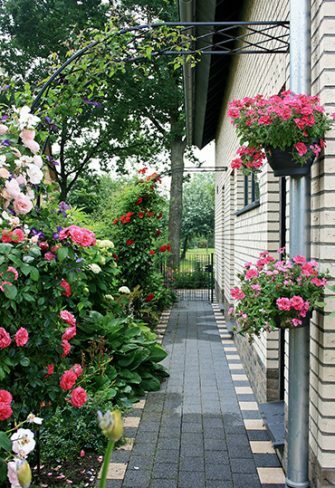 In a larger front garden, it can also welcome visitors as they approach the house door. In general, Rose Arches should look at home in their surroundings. Just as the size and scale of your construction should be in proportion to that of the house and garden, so their given style should be in keeping, too. Classic Garden Elements offers a range of high-quality choices. Our popular designs include the robust and durable Bagatelle Roman Arch or the airy and graceful Kiftsgate Victorian Arch. The truly imposing Portofino Roman Arch and the stately Brighton Victorian Arch are in a class of their own. All of our arches are made to the highest levels of steel craftsmanship. They are hot-dip galvanized and powder coated in our own workshops. All models come with a 10-year guarantee against rust. To ensure that your arch gives you long-lasting pleasure, it is essential to anchor it firmly in the ground. All the necessary anchoring components can be obtained from us. Optimal plants for Arches are clematis, sweet pea, honeysuckle or wisteria, or any other climbing plant. The choice of plant is of course a matter of individual taste, but there are some useful guidelines, especially for roses. It will often be better to opt for repeat-blooming, weaker-growing ramblers, which are generally healthy and easy to look after, and also less of a challenge for novices. 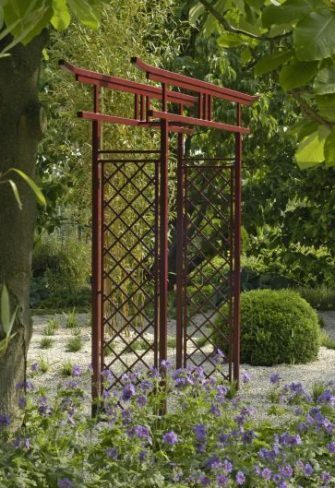 Other options include the newest generation of climbing roses or certain types of English scented rose, both of which look very well on a metal arch. After planting the rose, make sure to train the shoots horizontally, or at slight upward angle. Otherwise they will lose their foliage close to the ground and bloom only at the top. Regular pruning will help to shape the plant and to encourage maximum blooms.